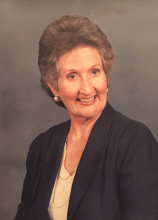 Helen Leona (Ballinger) Edwards, age 87, formerly of Mattoon passed away at 7:30 a.m. on Tuesday, February 5, 2019 at Snyder Village Nursing Home in Metamora, Illinois. Funeral Services honoring her life will begin at 11:00 a.m. on Saturday, February 9, 2019 at Schilling Funeral Home with Father John Titus officiating. Burial will follow at Dodge Grove Cemetery. Visitation for family and friends will be held from 10:00 a.m. until time of service Saturday at Schilling Funeral Home. Survivors include her husband, Walter Edwards of Metamora, IL; son, Michael (Phyllis) Edwards of Peoria, IL; daughter, Susan Puglia of Glen Ellyn, IL; five grandchildren, eleven great grandchildren and five great great grandchildren. Helen was preceded in death by her parents, four brothers and one sister. Helen was born and raised in Mattoon and worked many years at the Bergner’s Department Store. She was a member of the Immaculate Conception Catholic Church. A dedicated mother and homemaker, Helen was actively involved in taking care of her family. She will be greatly missed. Memorial donations in her honor may be given to the Alzheimer’s Association at act.alz.org/donate. Online condolences may be expressed at www.schillingfuneralhome.net or Schilling Funeral Home’s Facebook page. To send flowers or a remembrance gift to the family of Helen Leona Edwards, please visit our Tribute Store. "Email Address" would like to share the life celebration of Helen Leona Edwards. Click on the "link" to go to share a favorite memory or leave a condolence message for the family.